SYDNEY (Aug 28): The dollar held near one-week highs against a basket of major currencies early on Friday, having benefited from upbeat US data and as investors continued to cut back on safe-havens such as the yen. Commodity currencies including the Australian dollar managed to outperform their US peer after a solid rebound in Chinese equities helped lift risk appetite generally. The dollar index last traded at 95.688, not far from a one-week high of 96.031 set overnight. Since diving to a seven-month trough of 92.621 on Monday, the index has risen more than 3%. Against the yen, the greenback bounced above 121.00, pulling well away from Monday's low of 116.15. It last stood at 121.05. The yen showed a muted reaction to data showing Japan's inflation fell to 0%, the lowest in two years. The euro came close to $1.1200, having been knocked off its lofty perch above $1.1700 and last stood at $1.1258. Sterling extended its decline, after briefly dipping below $1.5400 for the first time in over a month on Thursday. It last stood at $1.5412. Lifting the spirits of dollar bulls, data showed the US economy grew faster than initially thought in the second quarter, an outcome that kept the chance of a US interest rate hike this year on the table. Analysts at Citi said all four components showed positive revisions: consumer spending, business investment, trade and government outlays. "Today's GDP adds to the positive flow of domestically oriented US data the Fed desires to see," they wrote in a note to clients. Expectations for a September move, however, have dwindled after a few Fed officials sounded a bit more cautious, citing global market turmoil and slower Chinese growth. "It would be rational to think that the Federal Reserve will avoid raising interest rates under such circumstances. But I got the impression that the Fed's communication is not clear," said Ayako Sera, senior market economist at Sumitomo Mitsui Trust Bank. The market will be keenly waiting for more comments on policy normalisation from Fed officials attending the Aug. 27-29 Jackson Hole Economic Symposium. 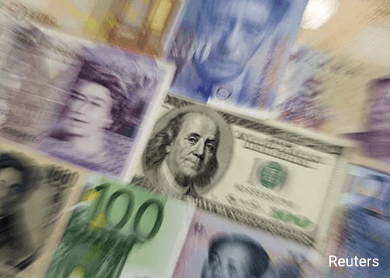 The lighter market mood overnight uplifted commodity currencies, which have had a torrid time this week as swings in Chinese equities compounded fears of a slowdown in the world's second biggest economy. The Australian dollar attempted to reclaim 72 US cents , continuing to recover from a six-year trough of $0.7044 hit on Monday. It last fetched $0.7168. It's New Zealand peer was close to 65 US cents, off its six-year low of 60 cents. The recent wild moves in global markets have shaken many investors. "It'll be a while before we know where the permanent scars are, but in the meantime, it's a reminder to markets not to form overly strong views on such things as when the Fed might start lift-off, or where G3 currencies are headed," analysts at ANZ said in a report.